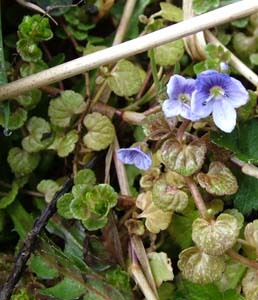 Speedwells are small-flowered plants that have adapted themselves to many environments. They can be found in most environments from rivers, heaths and streams to walls and hedgerows. Some species hybridise which can complicate identifications. Flower size and colour, in combination with habitat and leaf colour and shape are the main separators. Veronica filiformis - Slender Speedwell. This well-established escape has individual flowers on long necks. It has distinctive, rounded leaves that often have a reddish cast, and grows on bare soil - in this case a wall. Veronica scutellinia - Marsh Speedwell - grows directly in water and has bronze to red strap-shaped leaves. Flowers are in spikes. This is probably the hybrid between Water (Veronica anagallis-aquatica) and Pink Water (Veronica catenata) Speedwells. It is very robust and has pale lilac flowers. Growing in a slow-moving stream close to the sea. Germander Speedwell - Veronica chamaedris - has large, bright blue flowers, although I have seen a few with violet flowers. This species is readily identified by the two lines of hairs growing along opposite sides of the stem. The leaves are about 1 cm long and deeply toothed. Wood Speedwell - Veronica montana - always grows under trees, or in shade. The leaves are a distinctive pale yellow/green and the flowers are pale violet. A very delicate colouring. American Speedwell - Veronica peregrina - is a recent escape. The flowers are pale pink and grow from the leaf junction with the stem. I found this specimen on bare ground. Leaves are tongue-shaped. Veronica serpyllifolia - Thyme-leaved Speedwell - is a small species with oval leaves. The tiny blue and white flowers are held in spikes. Heath Speedwell - Veronica officinalis - has large lilac flowers on tall spikes. The leaves are oval and slightly toothed. Grows in high heath areas, but is also coastal. Brooklime - Veronica beccabunga - is another water-dwelling species with brilliant blue flowers and rounded leaves. The whole plant is quite fleshy, and the stems often have a reddish or pink colouration. It reputedely gets its excellent latin name from the fact that it bungs up streams or 'becks'. Wall Speedwell - Veronica arvensis - has tiny (2mm.) blue flowers that remain closed most of the time. Grows on walls and bare ground.